Author Dr. Jackie Keller's new book “Death Valley: A Winter's Journey” is the author's breathtaking description of her experiences living in Death Valley. Recent release “Death Valley: A Winter's Journey” from Page Publishing author Dr. Jackie Keller tells of a uniquely blended journey of scenic beauty, great adventures and self discovery against the backdrop of the glorious Death Valley National Park. Dr. Jackie Keller, a mother, clinical psychologist and professor, has completed her new book “Death Valley: A Winter's Journey”: a thought provoking and vividly detailed escape into the stunning beauty of a harsh, yet enchanting, national park. Her book offers a rare exploration of twenty-first century life in the Death Valley desert; the memoir of a middle-aged professor who abandoned academia and ran away to be a desk clerk at the Furnace Creek Inn. Her winter was the fulfillment of an old dream born of repeated brief trips to the park, and of the whispered promises of escape, great beauty and a quieted mind. And indeed, in the desert she found everything she had dreamed of, plus blessings and adventures she had never envisioned. Published by New York City-based Page Publishing, Dr. Keller's book walks the reader through a medley of shifting topics: the glory of mountains and sunsets, local history and the day-to-day rhythms of the village community of Furnace Creek. The reader will experience the discoveries of her new job and travel with her on awe inspiring, and sometimes funny, adventures with friends. All occurs while she daily, slowly, succumbs to the powerful calm of the desert wilderness. 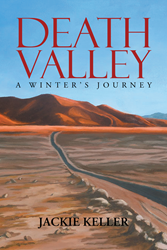 Readers who wish to experience this fascinating work can purchase“Death Valley: A Winter's Journey” at bookstores everywhere, or on line at the Apple iTunes store, Amazon, Google Play or Barnes and Noble.